Any basketball coach knows that scoring is different for every player. The best scorers have different signature styles that depend on their body type, personality, and approach to the game. Kareem had the sky hook. Kobe is the consummate gunner. Steph can shoot from anywhere. MJ and LeBron can do, well, anything — but you still think of MJ’s fadeaway and LeBron’s skill at the rim. Those are all unique styles that match a player’s specific skill set. 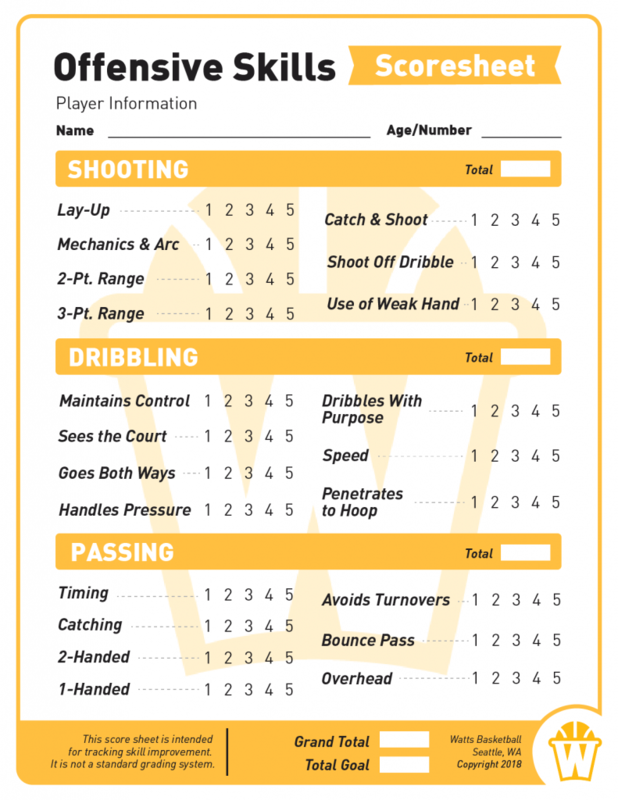 So, developing a young player’s scoring ability requires the player and their coaches to identify the transcendent signature skills that will make them exceptional. That is a unique process for every player — one that we use the scoresheet below to track. To be an effective scorer at any level of the floor, a player needs to be able to be able to go in any of the three directions. If they’re deficient in any direction, I don’t think they should be taking shots at the level of the floor where they have problems. The three directions are most important near the rim. Any player should be able to finish effectively with either hand, from a standing position, or while moving. Ideally, they should be able to do all the above in traffic. Farther out on the floor, a player needs to be able to go left or right or be able to take a jump shot. That way, they will force their defender to make a choice: An average defender will be able to take away one option. An exceptional defender might be able to take two. But the player should be able to use the third option and keep the possession alive. If one of the athletes that I coach is obviously deficient in going one of the three directions, we spend the bulk of their offensive development time working on the area where they struggle. If a kid comes in and they can’t get buckets at the rim with their left hand, we spend almost all of our time working on lefty layups and bank shots. I hear you, coach — you’re probably laughing about this one. Decision-making is the thing that kids struggle with the most. You’ve probably read that teenagers are very bad at making good or rational decisions. It’s literally because their brains aren’t ready to do it yet. You don’t need to read the literature to know that. You’ve seen some dumb-as-heck turnovers and shot selections during middle and high school games. We’re able to give the one-on-one attention needed to correct some of this bad decision making. That’s hard to do during a team practice after school. I have enough time and assistants to be able to keep track of a player’s field goals vs. attempts during shootaround and talk about the results with each player individually. We get a lot of players who think they’re Steph Curry because they made a half court shot when they were messing around with their friends. We can take the time to show kids the math — based on their own shooting percentage and experience at practice — and get them focused on shots that are good for everyone who isn’t the best shooter playing today. My staff and I work closely with every player we coach and get to know the ins and outs of their games. Since we’re not practicing for a rival game every week, we can take the time to stop a scrimmage and talk through a wayward pass or an over-aggressive gamble on defense and play it back. To keep going on that example of the half-court shot — it’s great if you can do something spectacular one time. It’s entirely different if you can do it whenever you want or need to. That’s why we spend so much time on skill development. We want each player to understand the reason and context to use every skill so they don’t make mistakes. They should know when to pull up and when to drive, for example, or when to try for a steal or try to stay in front of somebody. In order to make those in-game choices, a player needs to do something hundreds of times and understand the nuance of each motion. Only then can a player that be confident that they’re able to execute a skill in a game. That confidence can only come from repetition. But confidence and repeatability are short of what we really want a kid to be able to do with a new skill. What we want is mastery. I want my athletes to be able to know the technique behind whatever they are trying to do and know how to do it well. But I want them to be able to do it without thinking. That’s what Kyrie Irving does in this clip. During this play, he is completely focused on scoring. He doesn’t ever let his handle go, even when he puts the ball behind his back, or when Brook Lopez gets his hand on the ball. In this clip, Kyrie isn’t thinking about the handle. He simply handles. That’s what Bruce is getting at. Of course, I’m not promising that I can turn your point guard into Kyrie Irving or Bruce Lee in one camp. (That would take at least two camps.) But I can tell a kid how to the masters think and move and help any kid start playing their game that same way.